“The Ram temple is the centre of our faith, spirit and reverence,” said Rashtriya Swayamsevak Sangh (RSS) convenor Pratap Yadav. The Vishwa Hindu Parishad will organize ‘shankh naad’ (blowing of conch shells) in Delhi’s Ramlila Maidan on December 9, demanding early construction of a grand Ram temple in Ayodhya, senior VHP activists said on Thursday. 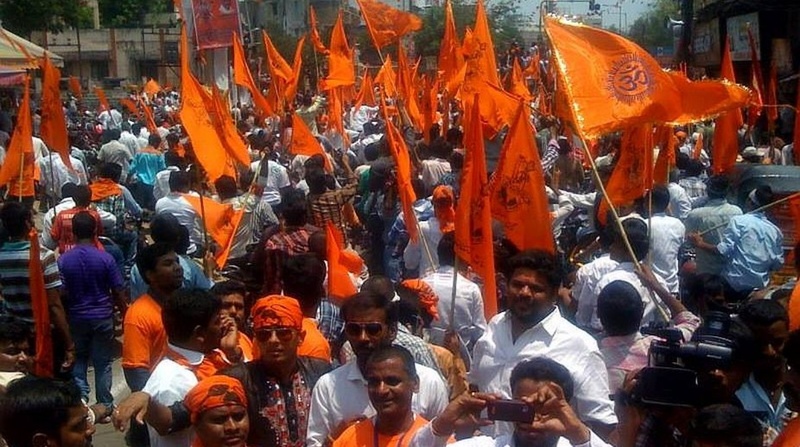 The VHP and other Hindu leaders met in Sector 12 in Gurugram today and said a large group from this Haryana city and Mewat will take part in the rally. A committee was formed for the preparation of the rally. “The meeting was organized under the chairmanship of VHP’s Gurugram president Ishwar Singh in which convenor Mahavir Bhardwaj, coordinator Anil Kashyap, Gurugram metropolitan coordinator Ajay Singhal, rural area coordinator of the district, Shiv Dutt, and other saffron supporters participated,” VHP media coordinator Arvind Saini told IANS. “The Ram temple is the centre of our faith, spirit and reverence,” said Rashtriya Swayamsevak Sangh (RSS) convenor Pratap Yadav. “If the court is not taking any decision, then the Centre should bring an ordinance to clear the path for the construction of Ram temple,” Yadav said. A special office has been set up in Sector 12 to monitor the preparations of proposed rally.